Here is a complete transcript of this morning's press conference from True North Sports and Entertainment on the purchase of the Atlanta Thrashers and the move to Winnipeg. Today's RLD Hockey Radio was interesting as it came right on the heels of the Winnipeg press conference. Our guest was Joe Yerdon from NBC's Pro Hockey Talk so we discussed a little hockey in the Peg as well as having our Stanley Cup Finals Preview. Joe is always a great guest so check it out. The NHL Network and NHL.com released their plans for wall to wall coverage of the Stanley Cup Finals. It all starts today with NHL Live this afternoon and special coverage of the Media Day tonight on the NHL Network. It is finally going to be official today at noon EDT when True North Sports and Entertainment will hold a press conference at the MTS Centre to announce that the Atlanta Thrashers will be sold and moved to Winnipeg for the 2011-12 season. The press conference will be carried live on the NHL Network and streamed on NHL.com. TSN.com is in full out celebration with an entire mini-section devoted to the move. Of course, Illegal Curve is the ultimate source on everything Winnipeg hockey. Welcome back to the start of a short work week. I did something that I rarely do over the weekend. After Friday's fantastic game seven when Boston got past the Lightning, for the most part I stayed completely away from the internet and Twitter until last night. Between dealing with all the tragedy from the Missouri storms at work and not taking a break at all during the hockey season, it was good to step away from the keyboard and watch a few movies and take a break from the real world for the holiday weekend. I also have been recovering from ehrlichiosis that I got from a tick. June is going to be a busy month with the Stanley Cup Finals on TV, trips to the NHL Awards in Las Vegas and to the Entry Draft in Minneapolis as well as some unplanned work travel so it was good to get a bit of a breather. Also, it looks like today will be the day the Thrashers officially move to Winnipeg. When the Preds lost to Vancouver, I lost a bet to the guys at Pucked in the Head and sent a package of local items to them and I got to see a few of them in use in this picture of Jason Kurylo's daughter decked out in Pred gear. They were such good sports that I'm receiving goodies in return. 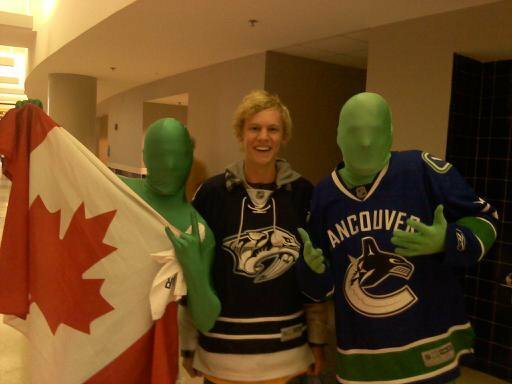 Vancouver fans as a whole were very gracious winners when they got past the Preds. In the midst of winning the 2009 Vezina Award, Tim Thomas teared up when I asked him about the chance to play in the Olympics in 2010. He said that it was an "older dream actually than the NHL." Now he is in the Stanley Cup Finals. Stand by for the answer to where that ranks. Nashville Predators defensive prospect Ryan Ellis is in the running for two key CHL Awards that will be given out during the Memorial Cup celebration on Saturday in Mississauga, Ontario. Ellis is in the final three for the Player of the year as well as Defenseman of the year for all of the Canadian Junior Hockey system. The Memorial Day weekend is finally here and not a minute too soon. There is no better way to start the weekend off than with the Boston-Tampa Bay game seven tonight. If you would rather get off the couch and for those of you who missed the group outing to see The Hangover (which is worth seeing despite what critics may say) last night, there is another outing tonight at the Nashville Sounds game.If you own a DVR (I don't), you could go to the baseball game then see game seven later. The schedule for the Stanley Cup Finals has been announced and will not begin until next Wednesday and could extent to within a week of the NHL Awards if it goes the full seven games. NBC will broadcast all games in the US except for three and four which revert to Versus. Rarely do we spotlight a single article in a post but this is a special occasion. J. R. Lind, who is a man of many talents, and former big winner on the TV show Jeopardy, pieces together the consummate article that captures the success of this season's Nashville Predators' team and puts it in perspective of the team's 13 year history. If you are a Predator fan, you will enjoy Lind's well-crafted journey. If you are outside the area, or a Canadian that got their first good look at the Nashville Predators brand of hockey, then this is a great primer for what makes this team successful in a "new traditional" market. Whatever your perspective is, set aside a few minutes and go here to read from the Nashville Scene a success story that anyone will find enjoyable and enlightening. We are headed to game seven in the East after last night's thriller in Tampa where the Bolts avoided elimination and are going back to Boston to play on Friday. The NHL has gotten on board to encourage fans to support the folks of Joplin. Missouri who have suffered $3 billion in damages. If you want the name of a specific person to help. I can steer you to them. Brian Rafalski of the Detroit Red Wings had a really classy retirement speech earlier today. He put his faith, his family, and the chance to serve others ahead of the six million dollars he would have made if he had returned next season. This should be a model for others making a decision to leave the game and making their announcement. What an exciting game last night in Vancouver. That is the epitome of what playoff hockey elimination games are all about. The Sharks held on for dear lives but Kevin Bieksa ended their hopes halfway through the second overtime period. Congrats to the Canucks and their fans. We are in your corner for the finals. I don't normally discuss my other job but dealing with the devastation in Joplin, Missouri from Sunday's tornado is really taking it's toll. Everyone's thoughts and prayers are need for the folks that survived the storm and are left with nothing. Here is a video of the estimated $3 billion dollars in damage that took out a third of the town. This week on RLD Hockey Radio, Ryan Porth focused on the pending move of the Atlanta Thrashers to Winnipeg with two special guests. First up was Richard Pollok of Winnipeg's preeminent hockey authority, Illegal Curve. Then, Launy Schwartz from Hockey54 joined us to discuss the challenges the team will face in Winnipeg in a small market with what will be the smallest rink in the NHL. Plenty of folks thought today would be the day when the official announcement would be made that the Atlanta Thrashers were moving to Winnipeg but as you will see below that will not happen. Oddly enough, we are to the point where the Conference Championships could be decided within the next 36 hours leaving us with the possibility of only four hockey games left in the season should one team sweep in the Stanley Cup finals. Could this really be the earliest end to a season in the recent past. Last night late, we had the post with the update on Alexander Radulov's KHL post-season awards and our thoughts on a return to Nashville. Make the jump for all today's headlines, news and links.. Yesterday we saw this tweet from @ChrisBottaNHL: Alexander Radulov named KHL MVP. We hope everyone had a great weekend since the world did not come to an end on Saturday. Luckily, we were still able to go see the Nashville RollerGirls defeat Jet City from Everette, Washington 156-67. There were several somewhat skeptical first-timers there and all were impressed and became die-hard fans. Your next opportunity to see the ladies in action is on June 18. Two more off-season activities for Preds fans are set this week wit a group viewing of The Hangover 2 on Thursday at the Thoroughbred 20 (details soon) and a night at the Sounds Baseball game on Friday. Tonight is our first recommended event for Preds fans looking for interesting things to do in the offseason. The Nashville RollerGirls have a home bout at Municipal Auditorium tonight at 5:30 that will be the closest thing to a a Preds game for skating excitement that you will see until next season. Here is our Facebook event page as well as the RollerGirls web site that has all the details. The NRG also got some great pub in the Nashville Scene this week. If you've never been to derby, you need to give it a shot. If you have been, we know you will be there. It is finally Friday in a week that has had four Mondays so far. We were shocked to hear that Jon Moncrief aka @Crief passed away early Thursday morning. Prayers and condolences to his family. I was fortunate to meet him last year at the draft at the Staples Center. In the short time I was with him, I could tell what a great guy he was and why he had so many friends. Gann Matsuda has a nice tribute. We are one day closer to the weekend aa play returns to the Eastern Conference tonight with Boston traveling to Tampa Bay for game three in their series that is tied 1-1. Last night's Canuck's blow out of San Jose showed why the were the best team in hockey in the regular season. Here are the remarks from Alain Vigneault and Todd McLellan before tonights game two between the Canucks and Sharks in the Western Conference Finals. Here it the latest lists of off-season events and important dates for the Nashville Predators and the NHL. Yesterday on RLD Hockey Radio, Predators broadcaster Pete Weber stopped by for a visit as Ryan Porth had his season wrap-up Predators round-table. Jeremy Gover from Section 303 and I also participated. We covered a wide range of topics looking back at the season and projection what will happen with all the free agents in the offseason. We have almost made it halfway through the week and are looking forward to getting together with some Preds friends this weekend to see the Nashville Roller Girls on Saturday night. Here is some info if you would like to join us. Today we have plenty of Preds news as well as from around the rest of the league. Boston and Tampa are now tied 1-1 in their series and San Jose will play Vancouver in game two tonight at 8 p.m. CDT on Versus. Here is a top ten saves of round two of the Stanley Cup Playoffs video from Houses of the Hockey and The Score. Guess which 6'5" goal had the best save of all. (He also had number six). Today we have plenty of news on the potential Atlanta to Winnipeg move with thoughts from numerous quarters, It appears that is will happen and probably sooner than later. There has been little resistance from the local fans compared to Phoenix and Nashville in the past few years. It is a real shame for those fans in Atlanta to become the first US city to lose a team to Canada twice. We have plenty of Predator news including one of the best interviews ever with Pekka Rinne as well as news from around the NHL. Pete Weber guests on RLD Radio today too. After a dark night on Monday, Tampa will try to take a commanding 2-0 lead against Boston tonight on Versus (7 p.m. CDT) while the Bruins will be fighting for their lives to not head to Tampa down 2-0..
Make the jump to see all of today's stuff. Here are the complete transcripts of Vancouver and San Jose's post game press conferences after game one of the Western Conference Finals. Ryan Kesler, Henrik Sedin, and Max Lapierre spoke for Vancouver while Coach Todd McLellan spoke for San Jose. Good Monday morning! Today marks the start of the first full week of the Predators' offseason but there is still plenty going on in the hockey world. Over the weekend we had feature stories on Shane O'Brien and the Predators' thoughts on Ryan Kesler's play in round two. The were both well received so check them out if you missed them. In a very physical game where every inch of the ice was at stake, the Vancouver Canucks came from behind to defeat the San Jose Sharks 3-2 in the opening game of the Western conference Finals at Rogers Arena. The Nashville Predators played a tough series against Vancouver in the Western Conference semifinals but came up short with the Canucks winning the match by a 4-2 margin. It was a hard fought series for the Predators who left everything they had on the ice but were beaten by a superior team. Pekka Rinne who had to be the MVP for the Preds said, "This year I thought we did everything we could. We played hard every single night and did our best and it wasn’t enough. Vancouver was just that much better. It’s still hard to accept but it’s way easier when you give everything you have." Yesterday, we took a look at the Eastern Conference finals and made our picks and today we will do the same for the Western Conference. The Vancouver Canucks and the San Jose Sharks are clearly the two best teams left in the final four and whoever comes out of this series with a win shouls be the favorite in the finals. All the talk leading into game one of the Eastern Conference finals was about who could survive the long layoff the best and not show up in the opener out of kilter. That question was answered midway through the first period when Tampa scored three goals in 85 seconds and never looked back as the Lightning beat the Boston Bruins 5-2 on the road at the TD Garden. Hart nominee Corey Perry takes us on a video tour of Las Vegas and the Palms Casino and Resort in preparation for the NHL Awards Show that will be at the Palms on June 22. The Palms is one of my favorite places anywhere. Make the jump to see the video. After having a successful first round, correctly picking seven of eight series, two of four in the second round was fairly mediocre. The choices in the conference finals doesn't get any easier. Both series are virtual tossups and could go either way. Today we enter the Conference finals with the Tampa Bay Lightning traveling to Boston to play the Bruins at 7 p.m. CDT on Versus. We will have a preview and predictions later today. We offer our sincere condolences and prayers for the family of Derek Boogaard who passed away unexpectedly on Friday night. Again we apologize to our readers for the Blogger outage on Thursday and Friday. Most everything has been restored but one post was recreated and is missing a few links. We had a ton of stuff yesterday and complete coverage from the Preds final presser that is all up now. Check it out. Make the jump for today's headlines, news, and links. The NHL Network has released information about their coverage of the Conference Finals which will be similar to what they have been doing with the addition of Marty Turco to the panel. Their preview show will be on Friday, May 13, at 6 p.m. Eastern on the NHL Network as well as NHL.com. This was a post that was supposed to go up yesterday but was delayed by the Blogger outage. The NHL had a conference call on Thursday with Boston's Vezina nominated goalie Tim Thomas. USA Today's Kevin Allen was our guest today on Ryan Porth's RLD Hockey Radio Show where we previewed the Conference Finals that begins tomorrow night. We also touched on the Atlanta situation and possible Conn Smythe Candidates. It's always great to talk to Kevin and get his insight into the world of hockey. My expectations were partially realized. Throughout the season, O’Brien added the grit, confidence, and swagger to a team that needed a little more of all three and was vital to the team’s successful playoff push in March and April that landed them with the fifth seed in the Western Conference finals. After a disastrous 20.5 hours of outage due to the Blogger platform having a major meltdown, we are finally back. It seems like it was a lot longer. Here is Blogger's explanation and apology. There are seven or eight posts still missing and we have been assured that all of them will return which will include all of our video from the final Preds presser. I've been pimping a story about Shane O'Brien from October as preparation for a season ending story that will be up shortly so thanks to those who have patiently waited. As time permits we will have other things up as the day goes on and a bunch of third round preview stuff this weekend including what the Predators had to say about Ryan Kesler's performance against then in round two. As had been rumored and previously reported by Dirk Hoag, the Predators have indeed signed Mattias Ekholm who was the Rookie of the Year in the Swedish Elite League this season. The deal is a three year entry level contract with no reports of dollar amounts at this time. Here are a few recreated links from Thursday morning's post. The original post appears to have not been recovered during the Blogger outage. Several items in the original post have been lost. Predators GM David Poile and Head Coach Barry Trotz take questions from the media at the Predators year end press conference. Follow the jump for the video and a list of key points that were made. Predators Head Coach Barry Trotz speaks at the Predators year end press conference. Follow the jump for the video and a list of key points that were made. At Wednesday's Nashville Predators final press conference a tearful announcement was made about Preds Associate Coach Brent Peterson remaining on staff indefinitely in spite of the limitations that his deteriorating condition with Parkinson's Disease has dealt him. There was not a dry eye in the house as the announcement was made. Predators GM David Poile speaks at the Predators year end press conference. Follow the jump for the video and a list of key points that were made. Predators CEO Jeff Cogen speaks at the Predators year end press conference. Follow the jump for the video and a list of key points that were made. The Predators season ended abruptly on Monday night but we have more news on the Predators than we have seen in a while as well as the outcome of last night's Glendale City Council meeting and news from around the NHL. We will have video and plenty of information from the season ending pressers and locker room clean out later today, tonight and over the next few days also. As an early heads up: RLD Hockey Talk this week will be a round three preview with Kevin Allen of USA Today on Friday at Noon. The longest season in Nashville Predators history came to an end on Monday night at the Bridgestone Arena with Vancouver defeating the offensively challenged Predators 2-1. The Predators had plenty of opportunities, especially in the first two periods but could not get one or two more pucks into the net. In the first five games of the series the case could be made that he best team won on each occasion. Last night, for the first two periods I think the Predators were the better team. In the first period, they had eleven scoring chances to the Canucks two, but only those two found the net. Bad ice and Roberto Luongo stood in the way of several potential goals. The Milwaukee Admirals face the daunting task of a game seven against the Houston Aeros at 7 p.m. at the Bradley Center tonight but will help be on the way? Several Predators who have gone through the rigors of of of twelve Stanley Cup Playoff games at the highest level of hockey could head to Wisconsin today to help the Ads move to the next level. The end finally came for the Nashville Predators but the hockey never stops at POTG. We will have The Morning After round-up within the next hour or so and plenty of day after stuff for the rest of the day. If you did not see Barry Trotz's post game video last night, it is worth a look. He is pure class regardless of the circumstances. Late tomorrow we will have the final presser from Barry Trotz and David Poile and plenty of locker room clean out stuff over the next few days. The Nashville Predators' season came to an end on Monday night at the Bridgestone Arena at the hands of the President Cup winning Vancouver Canucks with a 2-1 loss. As hard as the Predators battled, the better team prevailed in the six -game Western Conference semifinal match. How different this year is in Smashville. This time last year, the Predators' season was well in the rear-view mirror and I was fully focused on the upcoming NHL Awards show. This release would be the biggest news of the day. On today's Blackberry All Access pre-game show, Deb Placey and Bill Clement look at tonight's game six between the Predators and Canucks that will have a 7 p.m. puck drop at the Bridgestone Arena. Dan Rosen says the Preds know they can win at NHL.com. The latest Predator inspired History Will Be Made video is History Steps Up featuring Joel Ward. It couldn't happen to a nicer guy who doesn't know why he has had his recent scoring outburst but is enjoying being able to help the team. God Has No Favorites But The Sign Guy Does! Here is an interesting picture sent to me by Carol Swick of Franklin, Tennessee. When Predators coach Barry Trotz said "The task is one" after game four, the task was game five. The task is still one and now it is game six. The Predators and their fans are hoping that there will be a third task on Wednesday night in Vancouver but it all depends on what happens tonight at 7 p.m. at the Bridgestone Arena. Saturday's big 4-3 win over Vancouver was one of the more unexpected outcomes in a single game in this year's playoffs season. Joel Ward is on a run like he has never seen in his career and is tied for the most goals in the playoffs with seven, and has 12 points which is one behind leaders, Martin St. Louis and Ryan Kesler. Once again, today is the biggest game in Predator history when the Preds take on the Vancouver Canucks in game six tonight at 7 p.m. at the Bridgestone Arena. Here are videos from Barry Trotz, Joel Ward, and Pekka Rinne from the airport presser yesterday afternoon where hundreds of fans were loud and proud greeting the team home. We will have our Morning After (A Day Late) and our Game Six Preview up shortly and have updates throughout the day. Make the jump for today's headlines, news and links. Predators' goalie Pekka Rinne speaks on the tarmac at the Nashville Airport after returning from their 4-3 win in game five in Vancouver on Saturday night. Nashville Coach Barry Trotz speaks on the tarmac at the Nashville Airport after returning from their 4-3 win in game five in Vancouver on Saturday night. In the first few minutes of the video, there is a jet blocking out part of the sound but it gets much better. You can also hear the crowd chanting "MVP" in the background when Pekka Rinne exits the other side of the building. Coming of the biggest night of his career, Joel Ward speaks to the media on the tarmac at the Nashville Airport. He doesn't have any explanation for his offensive outburst but is enjoying his current success. Last Sunday, several hundred Predator fans showed up at the Signature Terminal on Hanger Lane for the Preds' return from Vancouver. It was a great experience for all involved, both players and fans. The Predators are scheduled to return around 4 p.m. CDT on Sunday so show up at the Signature Terminal at 801 Hangar Lane between 3:30 and 3:45 to see the team when they return from Vancouver after their big 4-3 win in Game four. Watch this post for further updates if things change in flight. Barry Trotz was in his element after the Predators 4-3 win over Vancouver in game five of the Western Conference semifinals on Saturday night at the Rogers Arena. Make the jump to hear numerous Trotzisms and a coach with a great personality that always tells it as he sees it and doesn't play games with the press. The video show why he is desering of the Jack Adams award at the NHL Awards show in Las Vegas on June 22. Joel Ward had two goals including the game winner on Saturday night in the Predators 4-3 win over Vancouver to send the series back to Nashville for Game six on Monday. Ward now has seven post-season goals and is tied with Daniel Brierre and Sean Bergenheim for the lead in goals scored in the 2011 Stanley Cup playoffs. The Green Men of Vancouver had a trifecta of victims of their antics on Saturday night in Vancouver as they performed their schtick for Sergei Kostitsyn, David Legwand, and Mike Fisher who all paid a visit to the penalty box. When Fisher had a seat, they showed him a cardboard cut-out of Carrie Underwood in a Canucks jersey. Shane O'Brien also visited the box but there appears to be no video of the green guys holding up a picture of the Roxy. For the first time in franchise history, the Nashville Predators won an elimination game and forced the Western Conference semifinal series back to Nashville for a game six on Monday night at 7 p.m. at the Bridgestone Arena. Joel Ward and David Legwand provided all the offense that was needed for the Predators who scratched and clawed to a victory that few folks thought would happen. The Predators scored early in all three period to play with a lead for some of the first times of the series. Our young friend Josh Sacco gave his famous rendition of Herb Brooks speech from the movie Miracle to sold out Bridgestone Arena crowd before game four of the Predators-Canucks Western Conference simi-final match. Unfortunately, it did not inspire the Preds to a win as the Canucks prevailed 4-2. After today's morning skate, Predators' coach Barry Trotz said "Our backs are a little bit against the wall." Never one to exaggerate the situation, that is about as much desperation as you will every get from the even-keeled coach. Hopefully, the team will play with more desperation than that when the puck drops at 7 p.m. CDT on Versus tonight. The somewhat controversial "Green Men" may want to consider a relocation to Music City after having a huge time during their stay over the last three days. Everyone that spoke with them and posed for pictures said that they were perfect gentlemen and were just enjoying their stay in Nashville. At home in Vancouver, they have been less than fully appreciated by the team and have the subject of complaints by visiting teams. Follow the jump to see the guys posing with "Big Ben," Nashville's most notorious fan/cheerleader and a video of them meeting Nicole Kidman and Keith Urban. The clock is ticking on the 2010-2011 version of the Nashville Predators. Admittedly, it is never over until one team or the other has four wins in hand and officially sends the other team to the golf course for the summer. The Predators will have to play three of the best games they have played this season, with two of them being on the road, to move on to round three. No one in the Predators dressing room or Barry Trotz is ready to roll over and say that it cannot be done. The Predators have made a career of coming back from completely untenable situations so they are in perfect position for a miracle finish, down 3-1 to the Canucks and facing the possibility of having to win three straight elimination games. The weekend is finally near and there is the potential that the NHL could be moving to round three fairly quickly looms large. If the Bruins and Sharks finish off their opponents tonight and Vancouver wins on Saturday, we could see the start of the Conference Finals round by Sunday or Monday. Within the hour we will have our Morning After recap of last night's Preds - Canucks game and other updates throughtout the day. On Thursday night it was the Ryan Kesler Show (Part Two), on Broadway in Music City. With actress Nicole Kidman, Keith Urban and a host of other luminaries in attendance, it was Kesler's star that shined the brightest for the second game in a row. The NHLPA announced the top three finalist for the Ted Lindsay Award that goes to the Most Outstanding Player as voted on by the players themselves. This award is similar to the Hart Trophy but may be considered to be more of an honor since it comes from fellow competitors. 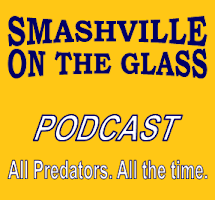 Yesterday on RLD Hockey Radio, Ryan Porth of the Red Light District, lined up Jim Hughson from the CBC on to discuss the Preds-Canucks series, hockey in Nashville, and several other topics. He was a great guest and it was an excellent show. His insights are great preparation for watching tonight's game which is the only game of the night in the NHL. Please got to the link to download or listen with the player below. Saying tonight's match between the Vancouver Canucks and Nashville Predators in game four of the Western Conference semifinals is "huge" is an understatement. There is a vast difference in going back to Vancouver tied 2-2 and being down 3-1 with a chance for the Canucks to clinch on home ice. That is what the Predators face in tonight's 7:30 p.m. contest at the Bridgestone Arena. It is the only game of the night, so the entire hockey world will be watching. There are no secrets as to what each team plans to do as it has been a chess match for 12 periods over three games. Tonight's match with the Canucks is definitely the biggest game of the year in Nashville. This is probably about the twelfth time that statement has been made in this forum but from here on out it will always apply. Tonight's game preview will be up within an hour. The Green Men from Vancouver are having a great time in Nashville and appeared to have mellowed remarkably as they were well behaved during the game and posed for any and all pictures with fans (including Jackson above. Follow the jump for a video and pictures from their stay in Music City. Nashville Predators prospect Ryan Ellis was named the Ontario Hockey Leagues Most Outstanding Player earlier today and will receive the Red Tilson Trophy and will represent the OHL as th enominee for the Canadian Hockey Leagues MVP award that will be presented at the Memorial Cup Championships. Sad night for the Predators and their fans last night as they took a tough loss on a questionable call when Ryan Kesler "chicken winged" Shea Weber's stick drawing a hooking call from referee Tim Peel who has risen to top ten most hated status in Smashville. Here is our game story and morning wrap up. It was a real shame that last night's game between the Nashville Predators and the Vancouver Canucks came down to a bad call to put Vancouver on the power play and then the Predators leaving Ryan Kesler free to roam the crease on the man-advantage. Ryan Kesler scored two goals, including the game winner in overtime, to power the Vancouver Canucks to a 3-2 win over the Nashville Predators and take a 2-1 series lead in the Western Conference semifinal match. Kesler had been held scoreless in his nine prior postseason games this season and broke out with his first goal one minute into the second period on the man advantage. He then assisted on Chris Higgins goal 3:03 into the third period that gave the Canucks the lead. Kesler's goal at 10:45 in to overtime on the man advantage was the difference maker in the back and forth contest. Kesler said, "It was finally good to get one. I didn't really change anything tonight. It was just me going out there and trying to work hard and do all the right things." Nashville took the early lead at 10:18 in the first period on a shorthanded goal by David Legwand. After the Predators fell behind on two consecutive Canuck goals, Joel Ward tied the game to send it into overtime with 6:42 left on the clock. The tremendous goalie battle between Robero Luongo and Pekka Rinne continued. Luongo came out on top stopping 28 of 30 Predator shots. Rinne actually had a better game as he stopped all but three of the 47 shots that he faced, many in an acrobatic manner. The game turned on a hooking call against Shea Weber 10:05 into overtime and Barry Trotz was not pleased, "I thought it was a little light considering all the other stuff that was going on. I've seen it, a sell by Kesler, he chicken-winged the stick and kept moving. If you look at it, Weber is pushing on him trying to pull the stick out of there. I've seen it before." Weber was a little milder in his comments, "I think they called a good playoff style hockey game, It's unfortunate that a call like that cost us the game." Pekka Rinne also got into the mix, "There were probably a few a little bit questionable calls tonight, and it cost us. But it's a game. It's hockey." Trotz admitted that the loss may have changed the complexion of the series, "I don't know if it will tilt it their way. They'll grab the momentum and it's our job to grab it right back." David Legwand sounded ready to move on, "We move forward. We've got to win Thursday night." The Predators lost Steve Sullivan to a "lower body injury" with 9:42 left in the opening period and he did not return. He was officially listed as day to day and will receive further evaluation in the morning. The Predators will practice at noon on Wednesday to prepare for Thursday's game five which will be at 7:30 p.m. at the Bridgestone Arena. Smashville. It’s not your ordinary hockeytown. But it is a hockeytown. The city has caught Preds Fever. This is what a playoff run does. It’s what it’s supposed to do. This is what this city has been waiting for. 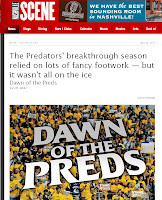 Today is a red-letter day for hockey in Nashville as the whole hockey world is talking about and watching the Predators, who are the new media darling team that was recently discovered in the lazy backwoods of the American South. All of the media elite from north of the border is in town, soaking up the hospitality, while they wait to see if the Predators are a contender or pretender as they go up against the regular season's best team. Vancouver (1-1) comes to Music City to play the Predators (1-1) after a heartbreaking double-overtime 2-1 loss to Nashville that ended in the early hours of Sunday morning. The Canucks saw a completely different team than they played in game one when they won 1-0 in what was described as the "closest blow out in history." There was so much news about the Predators over the last 24 hours that it was hard to sort through it all. The Canadian media has over-"run this town" and are reporting on every nook and cranny that they can find. The Predators players may find that living in the fishbowl for this series may be a good reason to stay and play in Nashville for the rest of their careers and give the Preds a little hometown discount to do so. Our game preview will be up shortly. No internet at our house has really slowed things down this morning. Pete Weber caught up with Nashville Predators' CEO Jeff Cogen over the weekend and discussed a variety of issues including NHL Awards, Pierre McGuire calling Nashville loud, attendance, fan passion, Mike Fisher, reinvestment back in to player salary, the playoffs and more. Follow the jump to hear his thoughts on the state of the Predators. In a very odd juxtaposition, hockey met up with a monumental moment in United States history on Sunday night as Washington Capital fans and a few major hockey journalists made their way from the Verizon Center, where the Caps had lost to Tampa 3-2 in overtime, to the White House where a huge celebration was taking place. The NHL Trophy announcement for today is the NHL Foundation Player Award is given annually to "the National Hockey League (NHL) player who applies the core values of hockey—commitment, perseverance and teamwork—to enrich the lives of people in his community". The award is closely related to the King Clancy Memorial Trophy, as both are awarded to a player who has made a significant humanitarian contribution to his community. The top three finalists this year includes Dustin Brown from the Kings, Mike Green from the Caps, and Vancouver's Sedin Twins. The final presentation to the winner will be made at the NHL Awards Show at the Pearl Theater at the Palms Casino and Resort on June 22. After a late night on Saturday and meeting the plane yesterday, we fell a day behind with our Morning After post, so please forgive us. Saturday's win was indeed One for the Ages as we said in the wee hours of Sunday morning. That post and title received same backlash from the Vancouver fans who simply thought it was a bad game for the Canucks. It was only bad for the Canucks in that the Predators defense completely stifled everything they tried to do. What a weekend with the Predators big win to tie their series with Vancouver and two other three series going to 2-0. We will have out "Morning After" feature within an hour and will have the last NHL Awards nominee at 11 a.m. CDT with the NHL Foundation Award top three. We will also have updates from the Preds and Vancouver as both teams prepare for Game Three tomorrow night at 8 p.m. CDT at the Bridgestone Area. The Predators will Practice at the Bridgestone Arena today at noon which will be followed by the Canucks practice at 2 p.m. Follow the jump for today's, news, headlines and links. Nashville Predator Coach Barry Trotz speaks to the media at the Nashville Airport upon his return from Vancouver where his team is tied 1-1 in their Western Conference Semifinal series with Vancouver. As a side note, you can hear the hundreds of Preds fans screaming in the background every time a player leaves the terminal. Follow the jump to see the video. Nashville Predators Vezina nominated goalie, Pekka Rinne answered reporters questions when the team arrived at the Nashville Airport earlier this evening. Follow the jump for the video. Here is the latest History Will Be Made Video from the NHL that features Pekka Riine's outstanding performance against the Vancouver Canucks in the Predators' 2-1 double overtime win in game two of the Western Conference simi-finals. Make the jump to see the video. The always affable Nick Spaling discusses the game winning play as well as his assignment defending some of the best players in the NHL during the Predators 2-1 double overtime win against the Vancouver Canucks in the second game of the Western Conference semifinals. Follow the jump for the video. The unassuming, consummate team player (and rookie), Matt Halischuk speaks after his game winning goal in Nashville's 2-1 double overtime win over Vancouver in game two of their Western Conference simi-final match against the Vancouver Canucks. Make the jump to see the video. 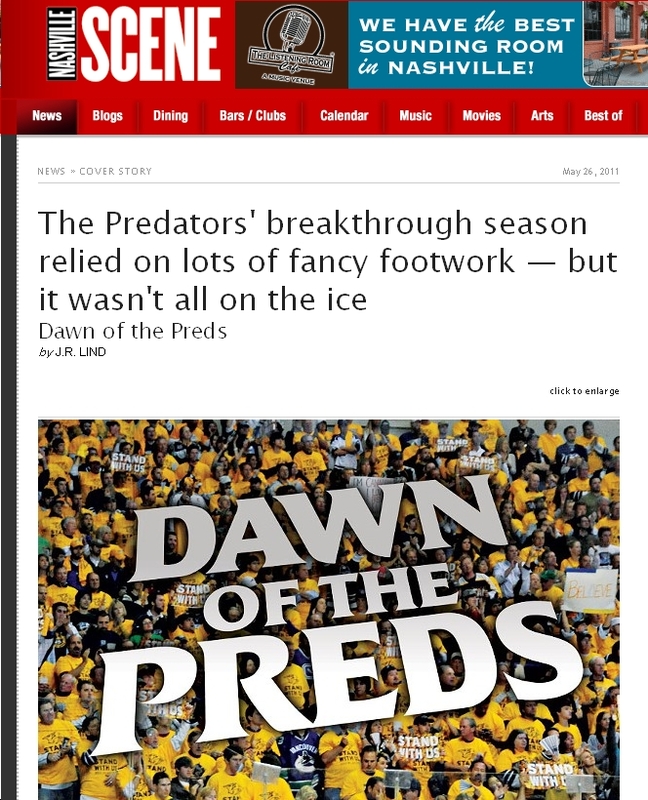 So much is made of the term "Predator Hockey" but folks outside of Nashville don't seem to know what it means. A highlight film of game two between the Nashville Predators and the Vancouver Canucks would be a perfect example of what the term means. There was stellar goaltending, strong defense, and a game winning goal by a player that few folks outside of Music City had ever heard of.